Poddar Heights is one of the popular residential projects that is located in Gandhinagar and Sabarmati. Developed by Poddar Group, this project offers thoughtfully constructed 2BHK apartments with modern amenities for the comfort of residents. Adding to this, it is situated close to the market, hospital and various educational institutions. S.G. Highway = 5.47 km. Satyamev Hospital = 1.16 km. Where is Poddar Heights located? Chandkheda, a prime residential locality for house seekers in Gandhinagar & Sabarmati. What apartment sizes are available in Poddar Heights? The project offers apartments sized 1170.0 sqft. What is size of 2 bhk in Poddar Heights? 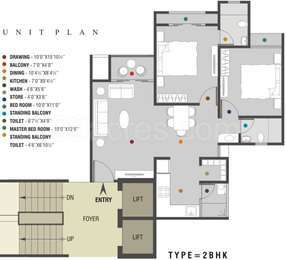 The area of 2 BHK apartments is 1170.0 sqft. How much is the actual area of Poddar Heights?The area of the project is 2.0 Acres. What is total price of 2 bhk in Poddar Heights? The price of 2 BHK units in the project is Rs. 3850000. What is the price of apartments in Poddar Heights? The units available in the project are priced at Rs. 3850000.